My Walnut hill 30 caliber swage set was sitting on my front porch when I got home from work. LOL Im like a teenager had to run downstairs and get busy. 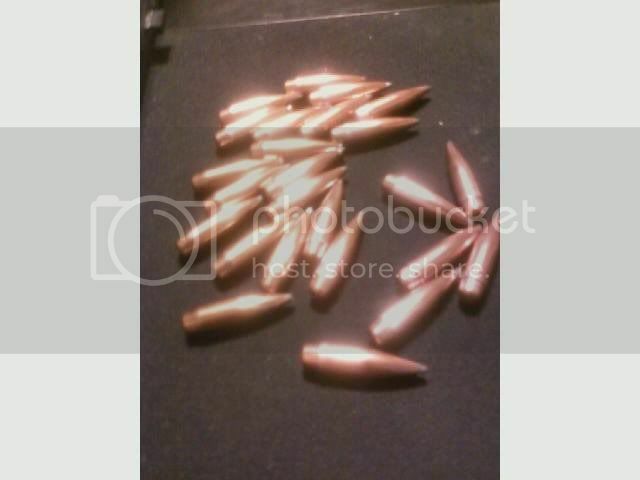 Made 60 180 gr Rebated boat tail open tip bullets tonight. Will finish up the other 40 tomorrow and see how the shoot out of my 06 this weekend Lord willing. I am still waiting on my tubing jacket making set so I can get some shorter jackets to make lead tip and I have a 6s flat point die for 30-30 just have to find shorter jackets. Location : West Plains, Mo. , St. Louis ,Mo. Nice..... defintaly have to share some photos at some point in time. "The Constitution shall never be construed to prevent the people of the United States who are peaceable citizens from keeping their own arms." Those are purty. What type jackets are you using? You said these are the open tips? I take it HP? yes hollow points. Corbins call them open tips because the lead core is solid. Nice looking bullets. Some day I will scrape up the funds to do those myself. You are finally comfortable with your casting capabilities when you find yourself casting boolits with sandals on! Now that you have samples, I really need to test them! I really really do. algunjunkie wrote: Now that you have samples, I really need to test them! I really really do. Very nice. Now I have something to look forward to after I get the 224 setup going. If they fly as good as his .224 bullets....you'll be able to split atoms at 100 yards....well, almost. thats awsome that is what i want to do eventually i would like to be able to swage for all the major hunting cal 30 cal 270 243 etc but thats a long ways and alot of overtime away lol! finished up my 100 180gr hps .... them made 25 190 gr soft points. These are awesome..... how much was the swage set? what press did you use?? I have Richard Corbins gear. RCE LLC. I have about 1400. in my 308 stuff. but i have 3 point form dies and 2 lead tip dies. you can get dies to make the 180s flat base for about 500 more or less. and you can get his sea girt press for around 300. Reload3006 wrote: I have Richard Corbins gear. RCE LLC. I have about 1400. in my 308 stuff. but i have 3 point form dies and 2 lead tip dies. you can get dies to make the 180s flat base for about 500 more or less. and you can get his sea girt press for around 300.
you can get dr blackmons stuff for your rock chucker. get into it for about 550 give or take. Those are really looking great. It is in my future hopes to have a 308 swage die as well for my soon up coming 308 purchase. Its hard to say my guess would be a 6 or 7s take it low and slow and then lap the devil out of them you should do ok. I just got done running some numbers. It costs me about 26 cents to make a match grade BTHP I have about 1400 in my dies so saving an average of 5 dollars a hundred .. on the low end 3000 bullets and I am even as far as tooling costs are concerned. I will shoot that many in about 5 years or so. So after 5 years I will be saving. Not as bad as i thought it would be. 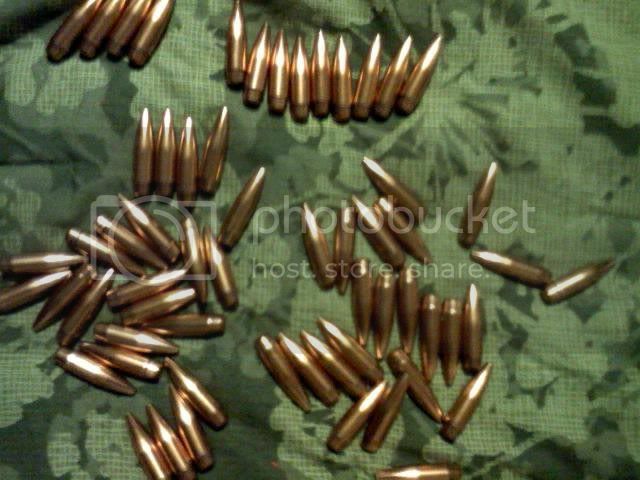 It costs me about 26.00 to make a hundred of these bullets. If I happen to get cheap or free lead even less the most expensive thing is the copper jackets. my cost with shipping is around 180.00 Copper tubing maybe a little less. If you are looking at match grade projectiles they will run any where from 32.00 to 67.0 a box I believe the bullets I make can hold their own with any I can buy so the Pay back isnt as far fetched as one may think. Jump to: Select a forum||--Welcome Member Introduction|--Stickies|--World of Reloading| |--Equipment Reviews| |--Feeding your Rifles|--Feeding your Handguns|--Feeding your Shotguns|--Pouring Lead, or Forming under Pressure|--Firearm Gunsmithing and Modifying|--Firearms, What say you?| |--Firearms Review| |--Gear and Accessories| |--Gear and Accessories Review| |--Hunting and Fishing |--The Lounge |--Critter Getters 2010-2011 Harvests |--Critter Getters 2011-2012 Harvests |--Fishing |--Tips and Tricks |--How do you cook your prey?